Keychain is a secure storage. You can store all kind of sensitive data in it: user passwords, credit card numbers, secret tokens etc. Once stored in Keychain this information is only available to your app, other apps can't see it. Besides that, operating system makes sure this information is kept and processed securely. For example, text stored in Keychain can not be extracted from iPhone backup or from its file system. Apple recommends storing only small amount of data in the Keychain. If you need to secure something big you can encrypt it manually, save to a file and store the key in the Keychain. There are four ways you can add KeychainSwift to your project. Simply add KeychainSwiftDistrib.swift file into your Xcode project. Alternatively, add github "evgenyneu/keychain-swift" ~> 14.0 to your Cartfile and run carthage update. Here is an example of a Package.swift file. Add import KeychainSwift to your source code unless you used the file setup method. 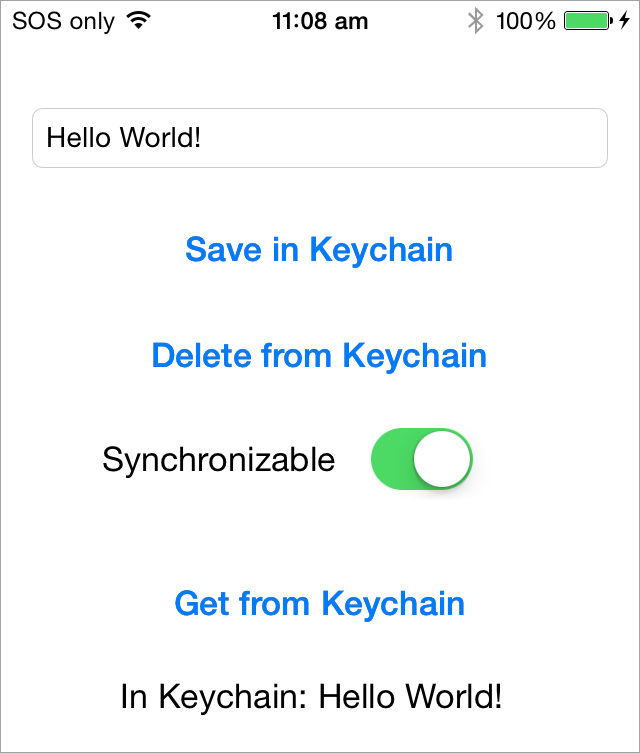 keychain.clear() // Delete everything from app's Keychain. Does not work on macOS. Use withAccess parameter to specify the security level of the keychain storage. By default the .accessibleWhenUnlocked option is used. It is one of the most restrictive options and provides good data protection. You can use .accessibleAfterFirstUnlock if you need your app to access the keychain item while in the background. Note that it is less secure than the .accessibleWhenUnlocked option. See the list of all available access options. Set synchronizable property to true to enable keychain items synchronization across user's multiple devices. The synchronization will work for users who have the "Keychain" enabled in the iCloud settings on their devices. Setting synchronizable property to true will add the item to other devices with the set method and obtain synchronizable items with the get command. Deleting a synchronizable item will remove it from all devices. Note that you do NOT need to enable iCloud or Keychain Sharing capabilities in your app's target for this feature to work. keychain.get("my key") // Returns "hello world"
We could not get the Keychain synchronization work on macOS. In order to share keychain items between apps on the same device they need to have common Keychain Groups registered in Capabilities > Keychain Sharing settings. This tutorial shows how to set it up. Use accessGroup property to access shared keychain items. In the following example we specify an access group "CS671JRA62.com.myapp.KeychainGroup" that will be used to set, get and delete an item "my key". One can pass a keyPrefix argument when initializing a KeychainSwift object. The string passed in keyPrefix argument will be used as a prefix to all the keys used in set, get, getData and delete methods. Adding a prefix to the keychain keys can be useful in unit tests. This prevents the tests from changing the Keychain keys that are used when the app is launched manually. Note that clear method still clears everything from the Keychain regardless of the prefix used. One can verify if set, delete and clear methods finished successfully by checking their return values. Those methods return true on success and false on error. To get a specific failure reason use the lastResultCode property containing result code for the last operation. See Keychain Result Codes. This manual describes how to use KeychainSwift in Objective-C apps. It has been reported that the library sometimes returns nil instead of the stored Keychain value. The issue seems to be random and hard to reproduce. It may be connected with the Keychain issue reported on Apple developer forums. If you experienced this problem feel free to create an issue so we can discuss it and find solutions. Thanks to Alex Nagy from rebeloper.com for creating this two-part video tutorial. Here are some other Keychain libraries. Thanks to diogoguimaraes for adding Swift Package Manager setup option. Thanks to glyuck for taming booleans. Thanks to pepibumur for adding macOS, watchOS and tvOS support. Thanks to ezura for iOS 7 support. Thanks to mikaoj for adding keychain synchronization. Thanks to tcirwin for adding Swift 3.0 support. Thanks to Tulleb for adding Xcode 8 beta 6 support. Thanks to CraigSiemens for adding Swift 3.1 support. Thanks to maxkramerbcgdv for fixing Package Manager setup in Xcode 8.2. Thanks to elikohen for fixing concurrency issues. Thanks to beny for adding Swift 4.2 support. Thanks to xuaninbox for fixing watchOS deployment target for Xcode 10. Thanks to schayes04 for adding Swift 5.0 support. If you notice any issue, got stuck or just want to chat feel free to create an issue. We will be happy to help you. Keychain Swift is released under the MIT License.